This past week I spent my time working on a crochet bag from the tutorial on Attic 24 blog. This is my first big item to try, I don’t think you can call cloths getting stuck into much crochet, well I don’t. I had the yarn for some time for this bag and was waiting until I had some wip’s out of the way. I know I know I said I was going to work on the second sock but I got distracted and couldn’t resist any longer. If you saw Wednesdays wip post I was just finished the base, well it is all complete. Later today I’m going to try lining it. My sewing machine have a love hate relationship, I love to hate it. I wish I were better at it but alas I’m not and if I can convince it to sew straight some hems then that will be an accomplishment. Of course if I actually manage to put lining into it that will be a miracle considering I’ve no pattern except what is in my head. With this bag complete I may now start to call myself a beginner crocheter and that’s better than where I was which was just learning to crochet. I did finish last weeks snowbaby cloth and I have cast on another but with the bag in action this cloth got no further than a row of cast on stitches and I’m to ashamed of that to take a picture of it. This week I’m going to have to finish the sock or at least do the leg of it and the cloth..I promise I won’t get side tracked by new and bright patterns and yarns…did that sound convincing ? This is again another project not on my list, in fact no crochet was on my list at the start of the year. For next year I think I’m going to have to add a special section for items such as these lol. Looking forward to checking in with you all, again I didn’t catch up with everyone last week, blame the bag ! This entry was posted in Crochet, Knitting, Year of projects. Bookmark the permalink. It’s easy to get distracted on Lucy’s blog…she makes some great stuff and offers fantastic free tutorials…. That’s a good looking bag. Yay for new skills! I don’t think it did sound convincing 😉 but then you’ve just been telling me about doing a crocheted blanket, so I know you’re easily tempted! Just like me! I have to say I have still not got used to your new blog name and each time I think, who’s that then! I obviously take a while to get it! 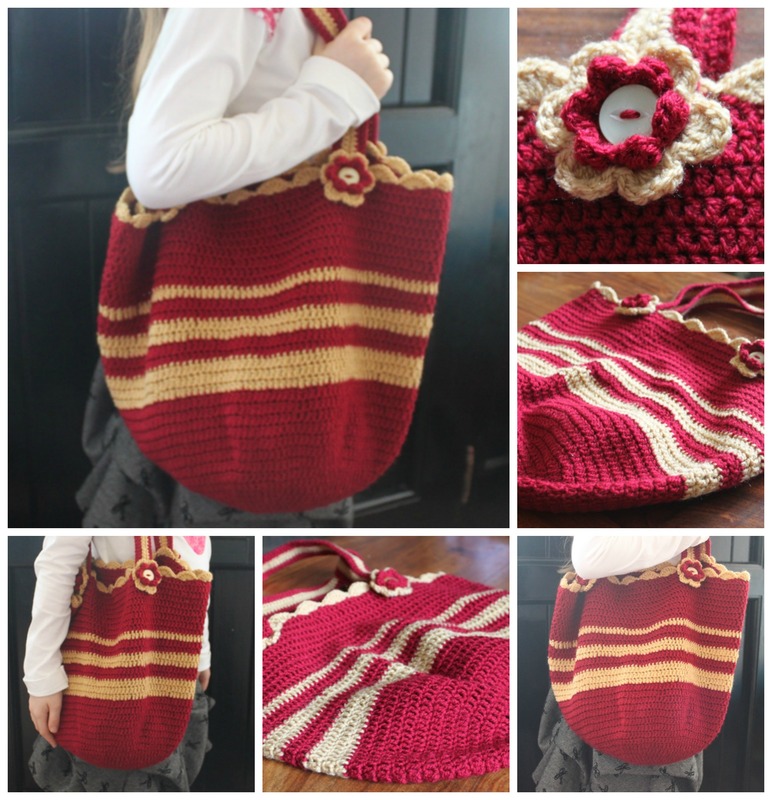 Your bag is gorgeous, I’m sure you’ll do a good job on the lining, and then you’ll be making them for the young ladies in your house in a choice of colours….I do love crochet, just so quick to see results don’t you think? In answer to your question that was a dk weight yarn, it’s obviously an acrylic as it is very hardwearing, but it felt good to the touch and had a bit of sheen and definition, not unlike cotton. The pattern is easy enough, just simple v-stitch, (triple, chain, triple) but isn’t free, and without it, I’m not sure I could have figured it out, but then I’ll definitely make it again. Go on you know you want to! You did a great job on the bag Ruth. Sure doesn’t look like your a crochet beginner. How great. I have tried twice to make a crochet bag. I still screw up recognizing which stitch is what..so ultimately my count is off..When I first taught myself..I had no problems, but the more I work at it, the worse it gets.. I need someone to sit beside me and point out this is the next stitch..(yes, I’ve tried using markers) .I scrunch the stitches so tight that…sigh, I’m complaining..I’ll stop..Congrats on moving to a beginner. That bag is terrific, Ruth! Harry Potter spirit it’s got. Thank you again for choosing me as one of your la hanau winners. I’m still deciding what to get.